I am officially on maternity leave from the cafe. So far, this hasn’t really made much of a difference! I ‘gracefully’ retired from actually being a barista a few weeks before New Daughter was born, mainly because I physically couldn’t stand behind the bar for long any more, and suddenly realised that everything useful was on the bottom shelf in there! I have a renewed appreciation for how physically demanding the workload of a barista is. 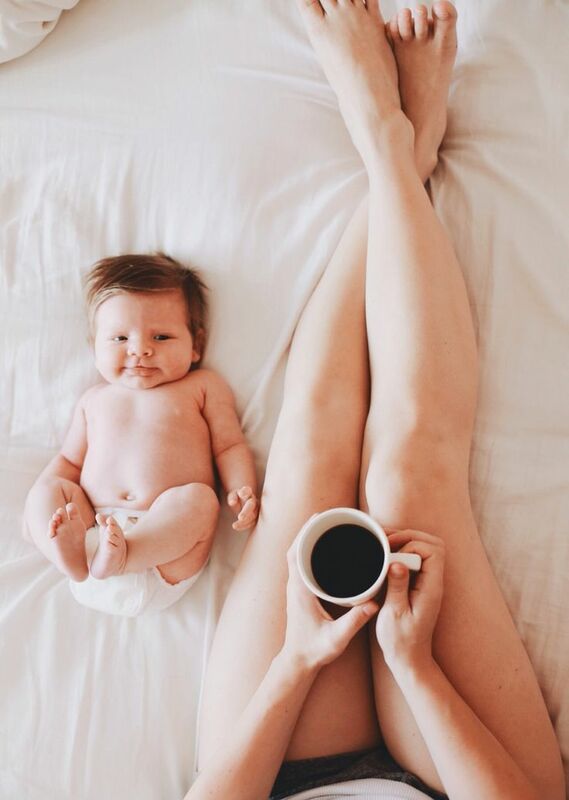 NB: That is not my child, and those are not my legs. Aah… the joys of entrepreneurship. Even if I am not actually pulling espresso shots, there are always at least a dozen emails waiting for me, or the website needs updating, or Facebook needs to take its daily slice of my soul, or its time for pay roll…Daughterling will gradually learn to fall asleep to the sound of me typing over her head, I’m sure. I am not really complaining; I honestly wouldn’t have it any other way. 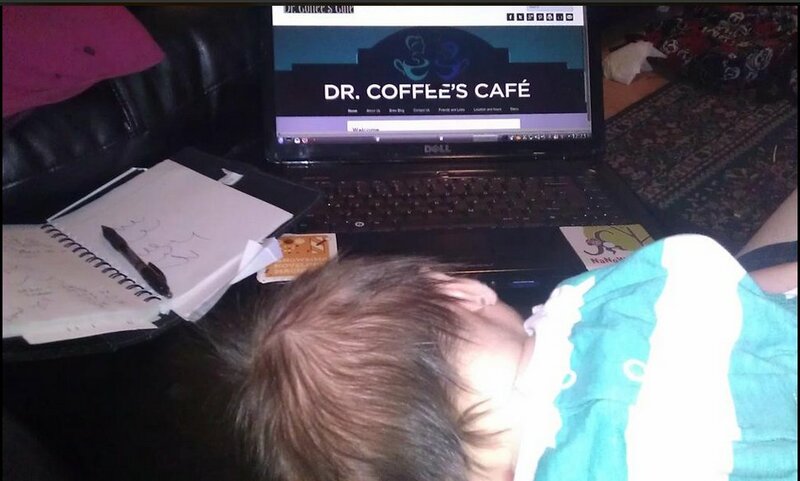 We opened Doctor Coffee’s Cafe #1 when our first daughter was just 5 months old; she grew up in a coffee shop, and if anything, it has only served to make her exceedingly sociable and confident. No one can ever accuse her of being the shy, clingy type of child and I do think being in a cafe environment with lots of strangers admiring her when she was tiny may have had a lot to do with it. Being self-employed like this and having the freedom to take my baby to work with me allows me all sorts of benefits which few parents with conventional jobs can afford. Recently, Marissa Mayer (CEO of Yahoo) announced that she would be taking just two weeks off to give birth to her twin girls. (see the article, here) Of course this caused uproar – that’s a terrible role-model for other women etc, it gives out the message that work is more important than her family.. yada yada yada. Mayer is a multimillionaire, so of course she can afford to pay someone to look after newborns for her. And the very fact that she is, and remains a millionaire CEO is because presumably she works her arse off and probably can’t engineer a way to take any longer away from work anyway. Going back to work in an office – sitting behind a desk in fact, is not too strenuous on a post-partum body either. She is in a position to make that work, but she is NOT in the same position most women find themselves in and therefore shouldn’t be treated as a role model. In some ways, I consider myself luckier than Marissa Mayer. In my own way, I am a COO of a company too – chief operations officer rather than chief executive officer, (though I’d never use that title at the moment and expect to be taken seriously!) and I’m a proud Mum to an adorable newborn baby girl. Whereas I am envious of Mayer’s success and certainly of her millions, I NEVER have to sit in an office any more, never have to wear a power suit, I have caffeine on tap to cope with 4am feeds, and most importantly I get to run my business AND take care of my wonderful girls at the same time, and really, I can’t ask for any more than that. BabyCoffee comes to work with me in her sling (which I actually bought while at the coffee conference in Guatemala). 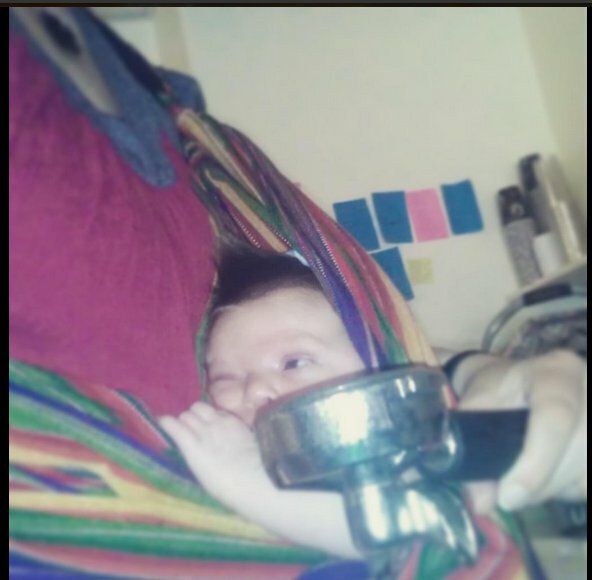 Slings are so useful – I can carry her hands free and make lattes at the same time!